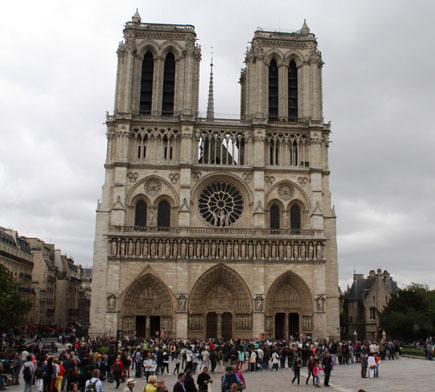 Nine new bells top the list of major projects as Notre Dame Cathedral in Paris celebrates its 850th anniversary through December 11, 2013. Many commemorative activities are planned throughout the year including World Organ Day on May 6, which promises to be the most outstanding international music event this spring. Many people visit Notre Dame Cathedral in Paris every day. Consecrated in 1163, Notre Dame is the center of Catholicism in France and a recognized symbol of the faith for Catholics throughout the world. The Cathedral is visited by more than 14 million tourists per year, and admission is still free. About the bells: Eight bells will replace those installed in 1856 after the original bells were destroyed during the French Revolution. One bell, called Emanuel, survived that war, and the new bells, which no longer live up to the Cathedral’s reputation, will emulate the sound of this 17th century bell. A ninth bell in the south tower will be a back-up for Emanuel in order to preserve this beautiful bell for future generations. About the organ: Sacred music has been integral to the cathedral since its construction, and the organ has been there since the beginning. Built on the gallery in 1401 the Great Organ has become, after many restorations and reconstructions, one of the most famous organs in the world. During this year of celebration, the Great Organ will be renovated and its 12,000 pipes, some from medieval times, cleaned. The magnificent cathedral will get upgrades during 2013. About the music: The organ’s glorious sound will be a focus of World Organ Day on Monday, May 6, 2013 when 850 organ concerts will be presented in places of worship and concert halls on five continents. Due to time differences in locations as diverse as Mexico, Nigeria, Australia, China, Russia, and the U.S., the worldwide concerts will stretch over more than 24 hours. 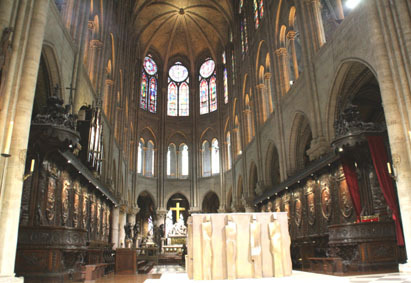 Each concert will include at least one piece of organ music representing the heritage of Notre Dame in Paris. See at list of concert locations here. Additional projects: Thanks to almost $8.5 million in donations other notable improvements include upgrades to the interior lighting system for the main Cathedral and the Treasury of the Cathedral, creation of a Jubilee Trail on the square in front of Notre Dame, publication of an in-depth book on the history of the Cathedral, and composition of new musical works. People from around the world are encouraged to make pilgrimages to the Cathedral in Paris and record these visits with the Archbishop of Paris. Read more travel stories from Beverly at Striped Pot and Austin Adventure Travel.